The perfect lawn it turns out is centuries old. The word itself comes from a Middle English word that refers to an open glade in a forest. Take all the trees away and grasses grow up pretty quickly. With just a bit of sunlight and rain it’s likely that at least some version of the plant family Poaceae (also called Gramineae) will grab some space and suddenly a dense forest can break apart into a sunny, nearly magical glade of green luxurious grass. Given that appeal, it’s no surprise that lawns began springing up around medieval towns, mainly as common areas where sheep, goats, and cows could enjoy meals, keep the grass naturally cropped and drop some fertilizer ensuring the next year’s lawn. Giant fields of grass it also turns out make a castle way more defensible because there’s nowhere to hide. By the 17th centuries, all the rich folks (like the famous “Green Carpet” at Versailles right outside Paris) in their big chalet’s had luxurious lawns and it was very much a status symbol. Back then maintenance was either through farm animal or through plenty of very expensive hired help using scythes to cut and weeding was done by hand. Thet idea of the lawn as status symbol continues with us today, if on a more modest scale. The rise of the suburb and the mid-20th-century explosion of golfers ensured that the lawn industry will stay in the green (literally and figuratively) for as long as we can see. And let’s face it, a lush green lawn is still something to be proud of. And on the best of days can still take us back to sun-drenched, dew-dampened forest glades of centuries ago that meant safety and comfort. But it can be a long hard road to a green luxurious lawn so we’ve done our part and collected the best grass seed for everyone. Whether you want golf style perfection or a more natural indigenous seed form of lawn we’ve got what you’re looking for. So feel free to dig through our list when you feel the need, the need for seed. First up is the old standard, Scott’s Turf Builder. 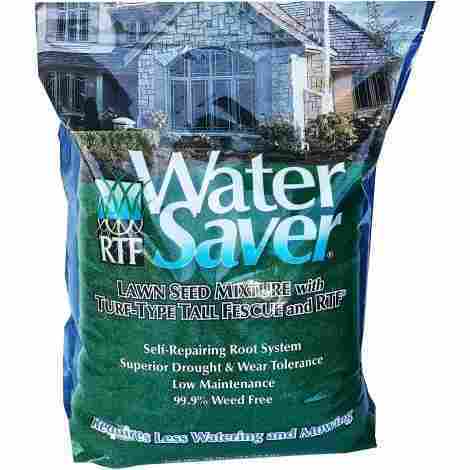 This three-pound bag of grass seed mix is designed to cover about 750 square feet of lawn. It gets great reviews across the board but it is important to remember that this mix is meant as a quick growing seasonal temporary repair grass. This is not perennial grass, it’s a one-season product, meant to quickly green up bare patches or do spot type lawn repair. Perfect for greening up a lawn in advance of a party or before a house goes on the market, but this is not the seed that’s going to provide a solid grass base for the long-term lawn. You can expect to see this seed popping up in the bare patches of your lawn within 4 to 7 days with care and plenty of water. And once the seeds reach 3 inches in height they’re mower ready so from planting to mowing can happen as quickly as 3 weeks. Rake up any bare stop then drop on some seed and that’s that. Beyond that just add water. Lots of water, and in a week or so you’ve got some quick growing, ground covering grass that’s going to cover any bald spot better than hair plugs. 750 square feet at a cheap price this Scott’s gets a lot done without your wallet taking a hit. The drawback, of course, is that it’ll have to be done next season as this grass isn’t perennial. It’s a one hit wonder but a great quick fix for the price. 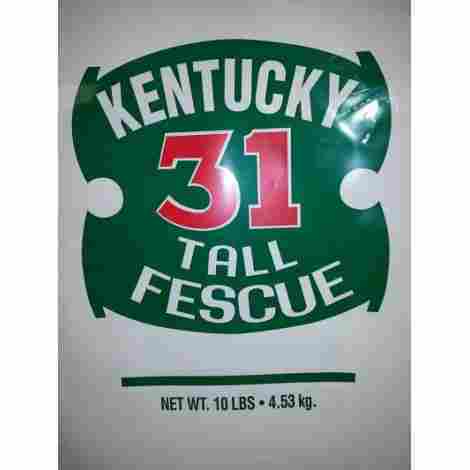 The Kentucky Tall Fescue is the workhorse of grass. It’s related to Kentucky bluegrass but is resistant to about anything a changing climate can toss its way. It’s a cool season grass but is tough, has deep roots that make it drought resistant and germinates quicker than bluegrass. It’s also shade resistant so can also thrive tree-heavy lawns. And while it will do okay in any type of climate if the deep Southern U.S. is your home this might not be the best choice. It can be applied with minimal effort and will stay the course over time. This grass is meant to do its best work in Northern climates. Cover it with snow for a season and it’ll still have some green in it when it’s that time and it’s back in business in no time. Its deep roots and shade tolerance nature make it good choice anyplace where spring and summer come and go all too quickly. This fescue grows roots much deeper than bluegrass or a lot of other similar products on the market. That’s where its drought and winter resistance comes from. It helps to bury the seed deep from the get-go so this will work best with aerated soil but once it’s in, it’ll be around for a long time. A tough seed at a big cost, but this 50-pound bag will cover an estimated 15-thousand square feet of lawn. It’s tough and long lasting shade and drought resistance. It’s a bit sensitive to the high summer temps in the deep southern U.S. but other than withering heat this seed grows deep rich and thick and a great across the board choice. 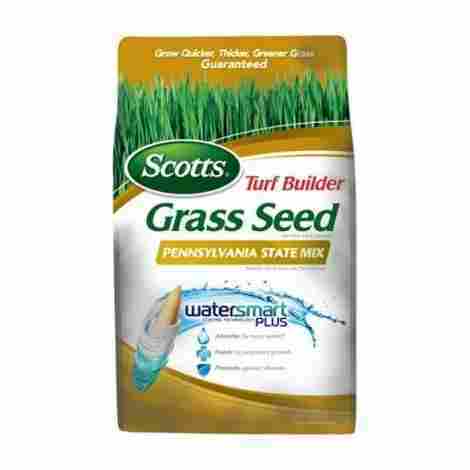 While this Scotts product is grown exclusively for Pennsylvania lawns but doesn’t let the name fool you it’ll likely work just fine on most any lawn. It’s a nice mix of Kentucky Bluegrass, Perennial Ryegrass and Fine Fescue that should grow in rich and thick in shade or sunlight. These seeds are coated in Scotts’ exclusive WaterSmart Plus technology that wraps the seed in moisture retaining material and feed to make sure your lawn gets off to a good start. Just drop it down add water and in 5-10 days the results should be popping up all over the lawn. This is a cool season grass so it’s best to let this germinate in the fall and live through winter in order to get a rush of green come springtime. This is a unique Scotts technology that coats the plant in materials that feed seedlings, retain water and keep the young grass disease free with a fungicide. The result is grass that grows taller, is more drought and shade resistant and ultimately results in a better lawn. 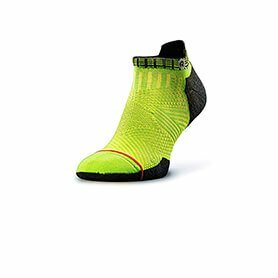 This is our pick for best value. A 7-pound bag comes in at a nice price that lets homeowners cover a lot of ground without breaking the bank. 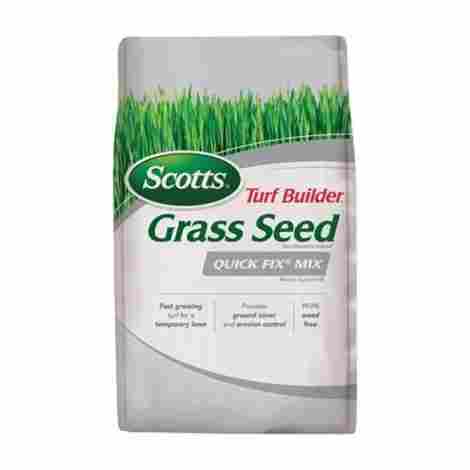 Plus its Scotts and that means it’s a quality product that even though was designed with Pennsylvania lawns in mind should find broad applications in lawns all over the world. The Pennington is billed as a particularly weed-free mix of grass that should grow in thick and lush, keep weeds away and requires less watering that some of the other entries on this list. This three-pound bag should cover about 15-hundred square feet of territory and grows in thick to maximize coverage and minimize weeds. The unique Pennington formula means that less water goes a much longer way. And considering the amount of water needed to germination on some of the other seed families on this list that could mean 30 percent less water and that’s nothing to sneeze at. A deep, dense root system is the reason why which also makes this a particularly hardy grass mix. Pennington wraps its seed in a powerful anti-fungal that should keep your seed safe in its earliest days. 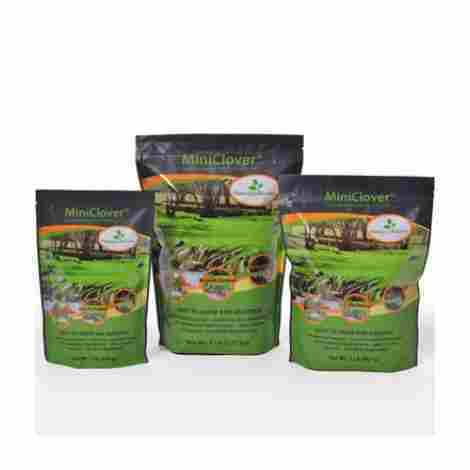 It includes a growth stimulant that should also get grass up and grow quicker and healthier. 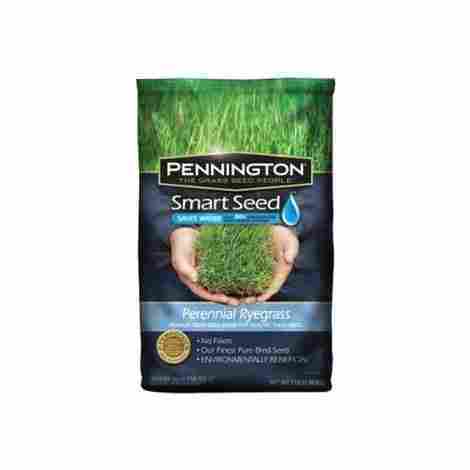 A three-pound bag might seem a bit pricey but the money’s well spent when you consider Pennington is almost guaranteed to grow quickly, establish deep seedbeds, grow quickly and aggressively and quickly cover any bare patches that tend to pop up in every lawn from time to time. So you’re done with grass, but still, want something lush and green to cover the lawn. Well, many gardeners are turning to White Dutch Clover. Now there’s no doubt that clover will take over a lawn in no time, and if you’re really considering a grass alternative this is really the easiest way to go. The flowers come in nice and white and with little or no care this hunter green lawn cover is an easy alternative for anyone not interested in the life choice that is maintaining the perfect lawn. We included this clover just for anyone who just doesn’t want to have to work so hard at maintaining a perfect weed-free lawn. And anyone who’s ever fought clover knows how challenging it is to do battle with the fast-moving resolute clover. So why not just give in and let it take over, providing moisture retention, erosion control and restoring nitrogen to the taxed soil. It is a cool season lawn cover but with a lot of moisture and a little care this hardy clover should pop up just about anywhere. It germinates in about 14 days and is coated with a special NitroCoast cover that retains moisture and helps the plants germinate quickly and effectively. Pretty cheap for a 5 pound back that should cover about 1-thousand square feet. That’s a lot of space and the clover will quickly cover bare patches or just simply take over a lawn with its distinctive white flowers that will have bees buzzing and nitrogen headed back into the soil in case anyone is anticipating a return to grass cover in the seasons ahead. Kentucky 31 showed up on our list farther up top but this time we’re recommending it not just for the grass but for the price and the value if there’s simply a huge amount of land that needs covering with a stable, beautiful resistant form of grass that once it gets going is going to stick around and make owning the perfect lawn just a bit easier that it is for any neighbors who are also chasing lawn perfection. It’s a fine bladed grass with more than a passing resemblance to Kentucky Bluegrass with fine blades. Kentucky 31 is designed to thrive in nearly every kind of soil imaginable. It’s adaptable like that and will take root in sandy, or poorly drained soil with equal gusto. Not only that but it’s designed to take root in both acidic and alkali soil which takes a lot of the guess work out of preparing any lawn. And finally this seed is designed for maximum toughness which means it can stand up to drought, or less than direct sunlight. The deep root system makes everything possible. It’s resistances, it’s adaptability, and it’s resistance to drought all come from the fact that this grass sends its roots deeply into any soil it comes into contact with. That means it’s not only great for erosion control but also that the deeper those roots go the tougher the grass is. A lot of seed for the prices this 10 pound bag of Kentucky 31 will cover about 1-thousand square feet of lawn with this nice variation on bluegrass. Add in it’s climate tolerance both for heat and cold and we’re talking a grass seed for the ages that’s guaranteed to stand to some of the worst punishment nature can hand out. 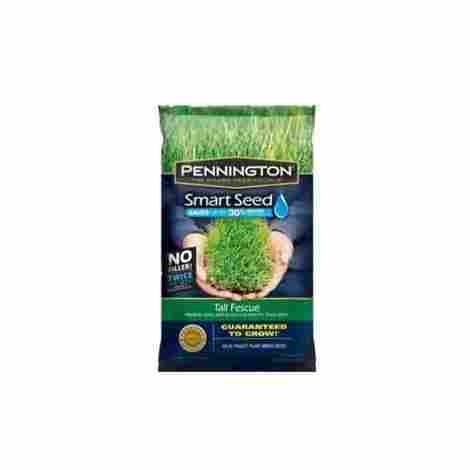 Another Pennington product but this one is a different family of grass, a rye blend that requires less watering and can stand up to more extreme temperatures than the other Pennington product on this list that’s primarily fescue. The rye is known for its deep roots and its ability to cover 12-hundred square feet of the ground. Plus there’s less water to do which makes this seed a great choice for deep southern U.S. with sandy soil. Sandy soil, rocky or most this Rey blend seems happy to take root where it gets thrown down. It’s a fast-growing grass as well so results should be easy to see in no time. It’s also able to handle a lack of water better than a lot of other grasses on this list. It’s 99 percent weed free and ‘guaranteed’ to grow a thick beautiful lawn. Them’s dangerous words for anyone who’s planted grass seed just to watch it either never germinate or get cast down by hot weather or lack of water. So if you’re environment needs something to be considered in regards to heat, or excessive anything, Penno might just be the grass that’ll make you lawn proud. A three-pound bag comes in at a competitive price, but it is a little high for a seed that’s only going to cover about 12-hundred square feet of the ground. But there’s a lot going on in this tiny package and a grass that’s going to be a good bet if there’s planting going on in difficult conditions. It’s also designed with fertilizer in mind so if there comes a time when a bit of fertilization looks like it’s in order, no need to worry, the Pennington can take it. A unique product on our list meant to be planted and grown beginning the fall. This grass is meant to tide over more sensitive grass over the winter. This specific grass seed is made from a unique blend of ingredients, including Dakota tall fescue, ryegrass, and something other very pertinent ingredients. That means that there’s seed in there that is going to thrive no matter the circumstances. It’s almost as a lawn supplement but can also stand alone and do any lawn warrior proud. This mixture of fall planted grasses is meant to provide cover and protection for your lawn over the winter and survive and even thrive in the cooler winter months. It grows well even as the sun gets lower and lower in the sky as it’s shade resistant and drought resistant so just plant it and let nature take its course. These grasses are specifically designed to go in the ground just before winter. What this means is that this fast-growing grass will do a lot to mend high traffic areas or just simply areas where summer grass didn’t catch. Lay it down in the fall and let it do its thing over the winter and come spring and summer a full lawn awaits. 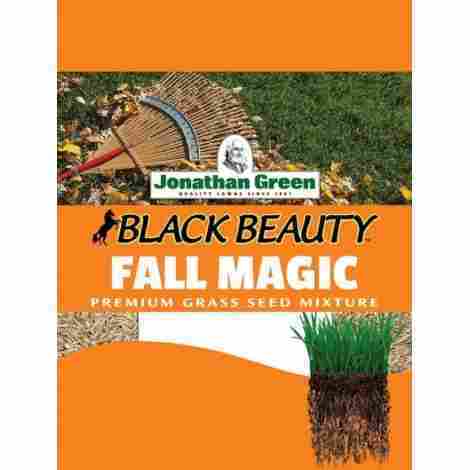 This comes in at a mid-range price for a 3-pound bag of seed but this is tough hardy stuff and a lively blend of five different seeds that should provide cover and protection for sensitive lawns over the winter months. It’ll come in particularly handy in trouble spots where nothing seems to grow. There’s very little soil prep as well so this is a great option if taking care of the lawn is a year-round affair. If you’re in a drought-prone area this is the seed for you. Specifically manufactured blended and created for areas that are either aren’t getting enough water or get high traffic this Barenburg seed, primarily Tall Fescue is the product that could save your lawn. This grass acts and looks a bit like bluegrass but requires substantially less water than almost any other seed on our list. It’s also self-repairing which means that unlike normal fescue this plant grows along runner underground that can grow new patches of grass and that means a more robust lawn over time. This grass is also great for planting in the transition zone between warm and cool climates and comes in a huge 25-pound bag which should provide plenty of seed for even the largest lawn. A relatively new breakthrough in fescue, self-repairing Fescue does something that most other fescues don’t, it actually grows. Most fescue doesn't spread, and eventually, over time, an entire lawn might need to be re-sodded. Self-repairing fescue can creates runners that make their way underground to create a new area of grass. That takes away the need for re-sodding and means a more robust lawn over time. Designed specifically for low water high traffic areas this tall fescue requires way less maintenance if lawn care really isn’t your thing. Spread it on the lawn before some rain and at that point let this low water seed do its thing. It germinates easily and quickly and should stand up to the longest, hottest summer or a long season of foot traffic. Expensive but this seed might just be worth every penny. This comes in a 25-pound bag so there’s a lot of seed to go last. Plus with the unique self-repairing feature this grass shouldn’t require much re-sodding so depending on the size of your lawn this one bag could last for quite some time. 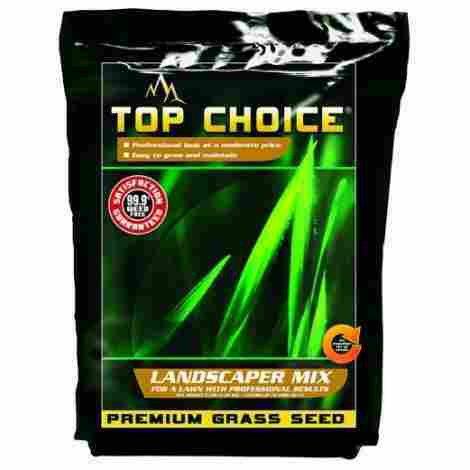 This top grade mix of three different species of grasses is designed to be almost entirely weed-free and is designed specifically for yards in the Pacific Northwest of the United States. The three kinds of grass in this are Stellar Perennial Ryegrass, Apple Perennial Ryegrass, and Homerun Perennial Ryegrass. That mix is meant to guarantee a robust lawn that will flourish year round. And the professional grade means that it has undergone some rigorous testing that guarantees it’s quality and purity. Ryegrass is a hardy strain and that makes this a grass that will stand up to harsh weather of all kinds but makes it a really good choice for winter planting. Reviews have it planted everywhere from its intended Pacific Northwest all the way down south to Arizona and North to Virginia. Point is it might be made for the Pacific Northwest but it’s a winner in spring and fall environments all across the country. The inspections standards help guarantee that the seed you plant will sprout and we see reports of 100 percent germination without too much hard work no matter the soil or sunlight quality. The seed comes with a guarantee so just in case it doesn’t work out for you Top Choice has a 24/7 helpline to solve whatever problems may come up. A mid-range price point makes a top choice just that: A great seasonal mix that will do wonders for your lawn in cool weather, spring or fall planting. The weed-free promise and satisfaction guarantee add to the seed’s curb appeal. But let’s be clear this seed isn’t going to be the best choice for anywhere temperatures hit high marks. Ryegrass is tough but it isn’t mean to handle a Texas or deep Southern summer no matter how wet things may get. But for cool temperatures ryegrass may be a perfect choice. So there you have it, our top ten picks for the seed that’s going to bring you lawn to a sparkling emerald greatness that will rival the sprawling lawns of French and English royalty, if perhaps on a less grandiose scale. Keep in mind a few important points: some of our choices aren’t perennial which means that they’re not set it and forget it types of grass and if re-planting every year isn’t your thing, think long and hard before buying seed that’s only meant for seasonal application. Also remember that not all grass seed is created equal and that some is going to do well in hot, humid southern climes and some are going to wilt like an ice cream in the sun. Make sure the seed that comes to your door is the right seed for your region if no amount of watering and care is going to be able to fight the elements outside your particular doorstep. Also, some of these choices do best when planted in the fall, some in the spring and some are good just about any old time. Again the thing to remember is it’s not just grass seed, it’s your lawn and it’s going to take a bit of study to figure out the one that’s just right for your climate but also the one that’s just right for you. 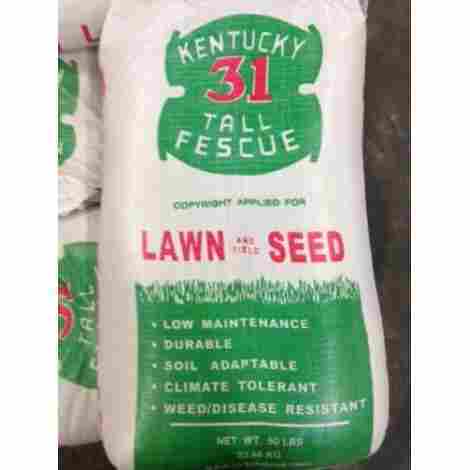 Tall Fescue, Kentucky Bluegrass, Ryegrass there are so many different seeds to choose from don’t make the mistake of buying the first and the cheapest brand that pops up on your list. Find out your climate range and take the time to make sure the seed you’re buying is going to flourish in your neighborhood. Also, our choice of clover seems odd but in the end it’ll guarantee a green lawn bright, pretty white flowers, visiting honeybees and almost no work whatsoever. It’s not for everyone but it might work for you, and don’t let anyone tell you different. Finally, remember it’s your lawn, make the most of it. If you decide to do battle with the dandelions and the crabgrass and the high traffic dirt spots, and the sunken wetlands that might all exist at the same time in one lawn, well then we’re sure you’ve got the talent to fix all those problems. It won’t be easy, but with some help from us it might be a bit cheaper than you expected and there might be some choices here that make the battle a little less arduous. But we can guarantee that somewhere in this list you’re going to find the tools to help you make your patch of royalty be it big or small, a thing of perfection. It may be the best seed in the world, a perfect blend of Rye, and Kentucky Blue, but if it doesn’t germinate it’s just so much birdseed. That’s why it’s important to do two things, one is to pick a seed that isn’t afraid to put its germination percentage right there on the packaging. At the very least work with a seed company that tells gardeners that they’ve done the bare minimum to ensure that most of the seed you put on your lawn is going to become grass with the right amount of care. That doesn’t mean of course that there isn’t work involved to make sure that seed comes to life, that means following directions that could include in some cases aerating, and in most cases lots and lots of water on the front end. It can also mean planting in the right season and in the right region. Assuming the work is put in on the front end, we want to make sure that whatever seed you decided on is going to have a great chance of becoming the perfect green lawn. We tend to think of drought resistance as proof of a hardy seed that can take a little abuse and end up making a lawn look great. So one of the big criteria for us is finding the seed that can get along (after germination) without too much help from the water company. We have a sinking feeling that these days of shortages and unpredictable weather extremes is the new normal so we’re looking for a seed that is going to be able to get hit by everything from ‘snowmageddon’ to a tropical storm to a long hot summer and come out swinging. Most seeds these days tout themselves as drought/heat resistance but the proof is in the pudding and lot of the ryegrasses that thrive up North might not stand up to a deep Southern summer and so we’ve included a fair amount of tall fescue’s and other grasses that are hardy enough to stand up to a full on Summer sun. But no matter where home is, it makes sense to look for a seed that can stand the heat and can also go for a while without water so we’ve made that one of our search criteria. Most of our choices for grass seed are mixes, the idea here is that a bit of variety especially when it comes to seasonal sodding is going to prove a smart way to go and give gardeners the opportunity to guarantee some form of lawn coverage the year round. A mix of seed will also help make sure that something is going to take hold on nearly every lawn. So be it ryegrass blends for the Pacific Northwest or a specific Pennsylvania mix made exclusively for various parts of the country it makes sense to pick a seed mix that seems to match your lawns growing zone and shade ratio. The last important category we looked for in choosing seed is its adaptability. At the end of the day, gauging soils acidity or alkaline levels isn’t something most yard workers want to mess with. So we tried to find the seed that is easy to grow and aren’t too finicky about the soil they call home. It’s impossible to find a perfect seed for every environment and every season and every type of ground so it will never be as simple as just heading out to a hardware store and buying grass seed, but we did look for varieties that are going to give the searchers for the perfect lawn the seed that’s going to prove the most versatile and the ablest to take root in any kind of soil. Q: When should I mow newly planted grass? A: Generally, don’t let a mower near any new grass until it’s at least 3 inches high. That’s going to take a few weeks so be patient. If you cut it any sooner than that it might not be strong enough to handle the stress and that’ll be the end of what could have been a promising lawn. Q: How do I know what Grow Zone I’m in? A: For that matter what is a growing zone? Well, we’re glad you asked it’s a map of the United States produced every year by the U.S. Department of Agriculture that is a color-coded map that breaks up the United States into 13 zones. And when you buy seed you should take some time to make sure your seed will thrive in your growing zone. Here’s a link to the USDA map if it’s time to go plant hunting. Q: Why would it ever be necessary to lay seed that isn’t perennial? A: Just like George Washington Carver learned way back in the day, soil gets tired. By that we mean it can get drained of nutrients over time. That’s why it makes sense from time to time to plant an annual crop that will put some nutrients back into the soil. That’s one reason to plant an annual crop like Ryegrass in the fall sometimes with the full expectation that once spring comes around it will have to happen all over again. We get it, it’s hard work, but it might just be the thing that makes your lawn sparkle like Oz when it’s time to plant in the spring. Q: What is self-repairing grass and why is it worth considering? A: It turns out that a lot of grass, take fescue, for instance, will grow, but it won’t spread. That means that a lawn of tall Fescue isn’t going to expand and take over a lawn like say crabgrass of bluegrass will. Until recently that is, thanks to genetics scientists have created a type of fescue that sends runners under the soil to establish new fescue colonies. This is kind of a big deal as this advance makes it possible for fescue to slowly but surely take over a lawn instead of just staying in the place where it was planted. It doesn’t sound like much but it can mean a lot less work and a lot less re-seeding. So if you’re looking for consistency of grass on your lawn and you’re a fan of Fescue look for self-repairing seed. Q: When should I plant my grass seed? A: Honestly, it varies. But here’s the thing to think about, do everything possible to make sure you give that little seed the chance to grow into thick green grass. With that in mind, there are few things that will kill grass quicker than a brutal summer sun. So, the one time we can say when it’s a bad time to sow grass in summer (and of course the dead of winter). So plant in early fall or early spring when there’s plenty of sunlight but temperatures are moderate. The added bonus is that there’s less water needed to help the seed take root. So while it may seem counterintuitive to plant when winter is coming on, keep in mind that the goal here is to get that grass to take root and get settled. It’ll find through its long winter’s nap and wake up in the spring ready to get back to growing.